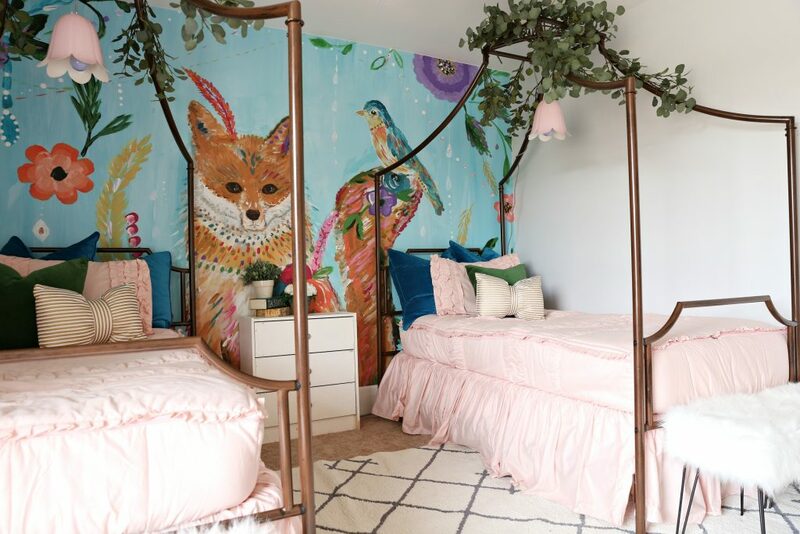 I have searched high and low for different girls bedroom ideas and I finally got my girls bedroom done and I am so thrilled how it turned out. 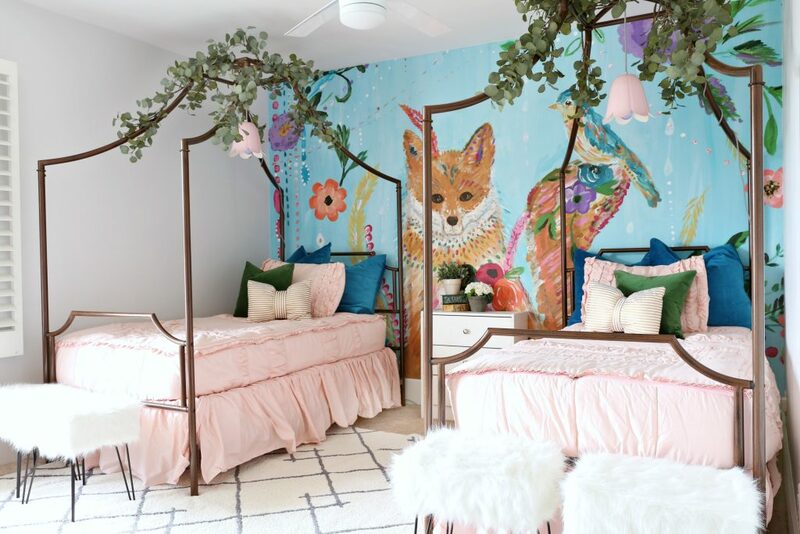 For my girls bedroom I wanted it to be very whimsical and playful and I think that’s exactly what I achieved. 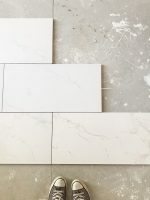 Before I show you the final reveal let me show you the before picture. It was a very very plain room with brown carpet. 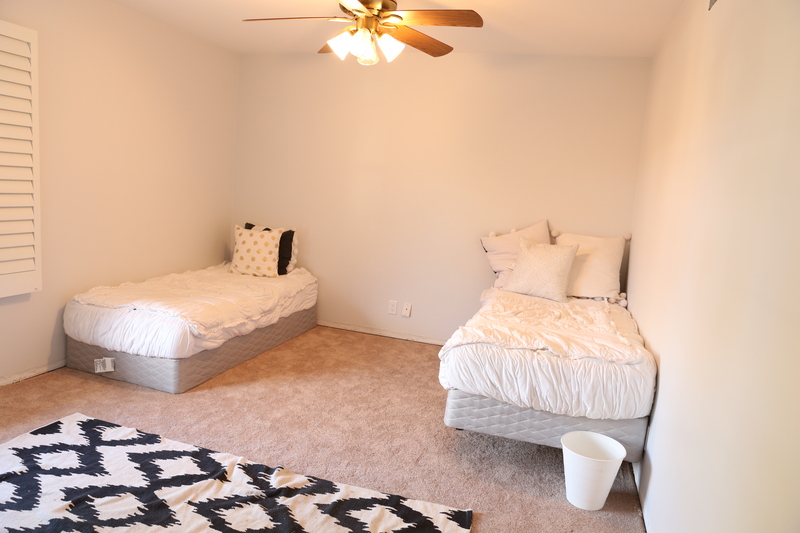 When we first moved in we had a million projects going on so the kids room sat with just the beds for about two weeks. I knew I wanted the kids rooms to be done as part of their Christmas gift. 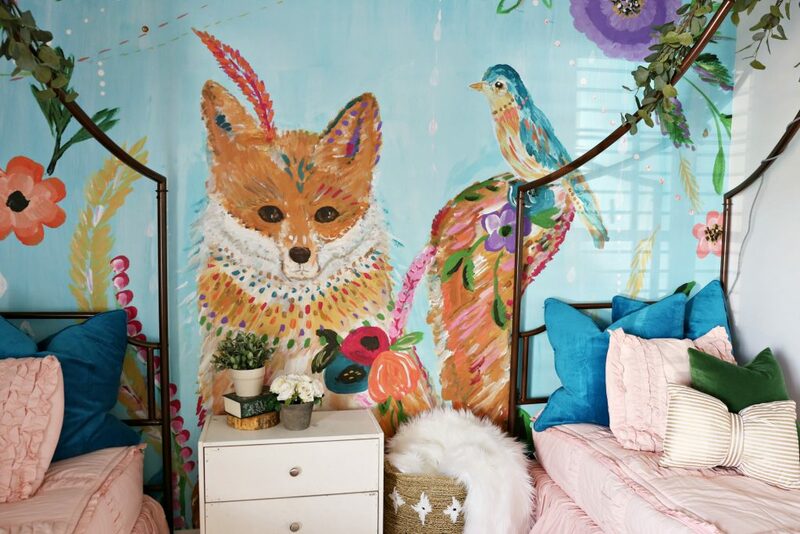 The first thing I got for the girls room was this amazing mural by Bari J. she is such amazing artist and she happens to be local in Arizona. I have seen her work in many different places including the cutest phone cases ever at Anthropologie. 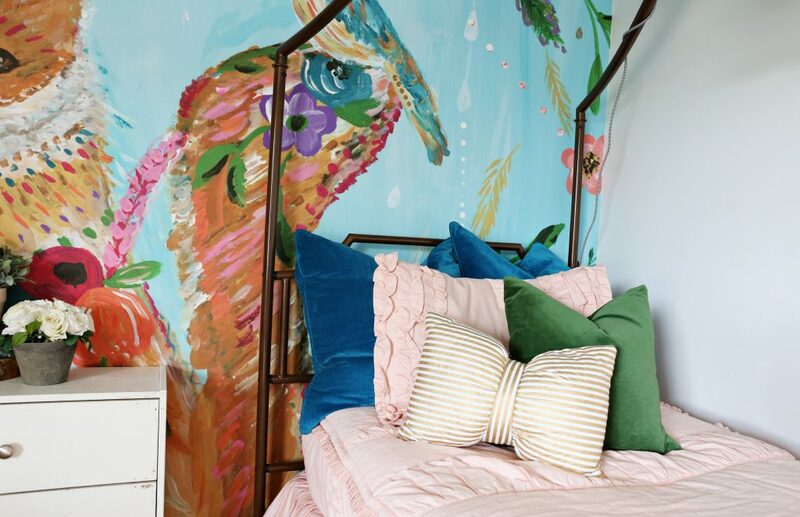 You all know how much I love a accent wall and I wanted something epic in my girls bedroom and I believe that is exactly what I did. Can we just talk about this stunning mural!!! I honestly can’t even handle how amazing it is!!! This cute fox just makes me so happy. 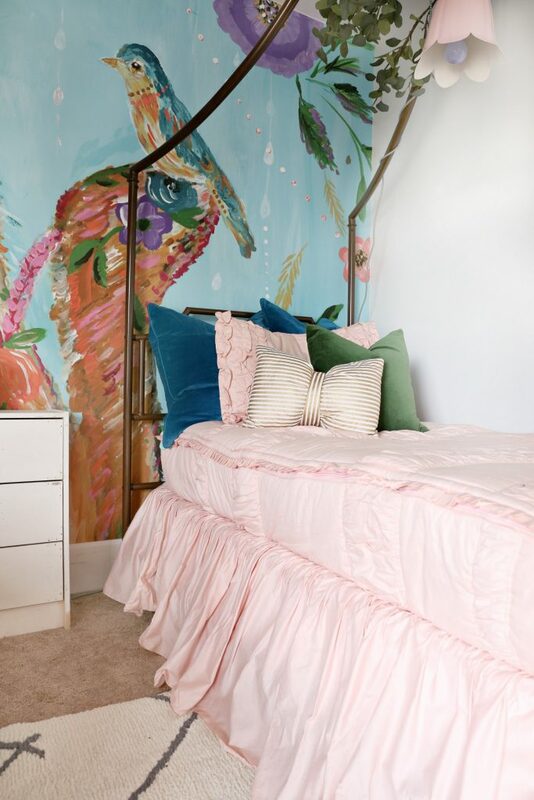 The mural came in three different wallpaper sheets and can be ordered from Murals Your Way. It looks like it was hand painted right on the wall. I am going to share a full tutorial on how I put up the wall mural very soon. The next element in the girls bedroom, I picked out was the bedding. Every since we got our very first set of bedding from Beddy’s we fell head over heals in love with it. 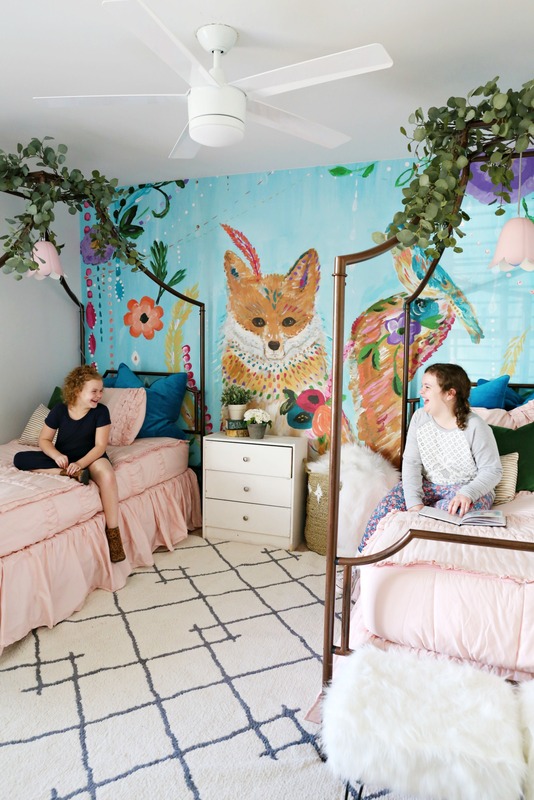 My kids did not want any other bedding and I wanted them to make their beds every day and Beddy’s bedding was the only way I knew it would be done. 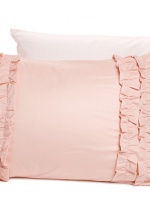 I picked out the Vintage Blush ll Bedding with the matching bedskirt. 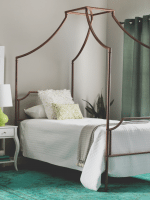 Can I let you in on a secret, at first I had just a plain white bedskirt I have never been one to get a fancy bedskirt and I learn something major, having a matching bed skirt makes a HUGE difference. 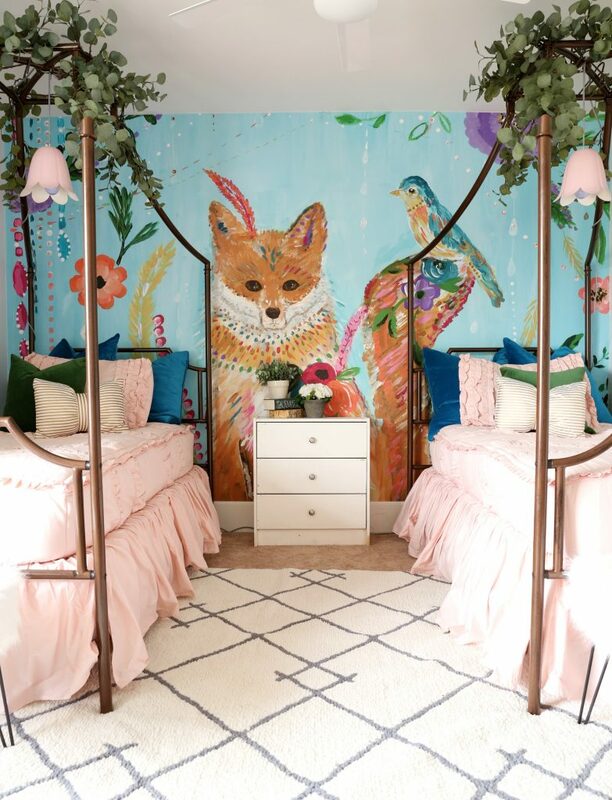 The next piece that I picked out for the girls room was their canopy beds. I found the kids beds on Overstock. 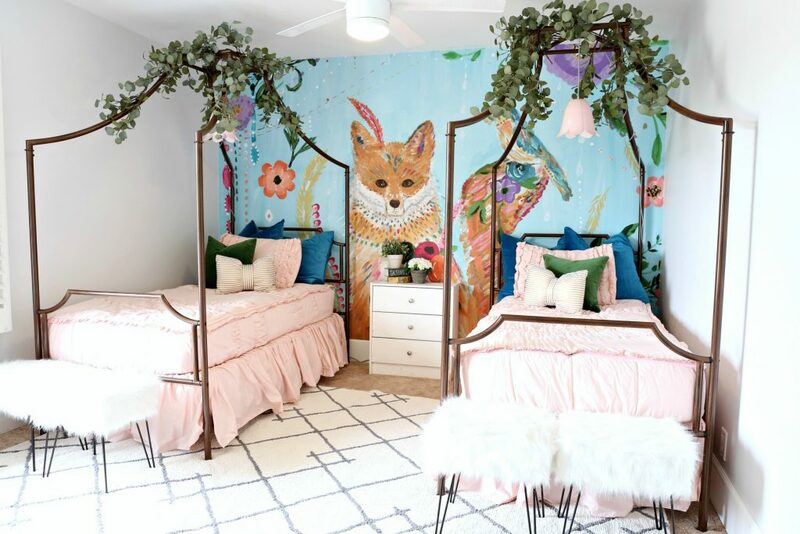 I knew that I wanted their beds to be stunning I was going to make them headboards like I did in their last bedroom which you can see HERE but I did not want to cover up to much of the mural. I searched high and low until I found these ones and I love how they turned out. 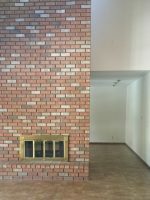 The color was a bit more copper which I was thinking they would be more gold but they still really work in the space. 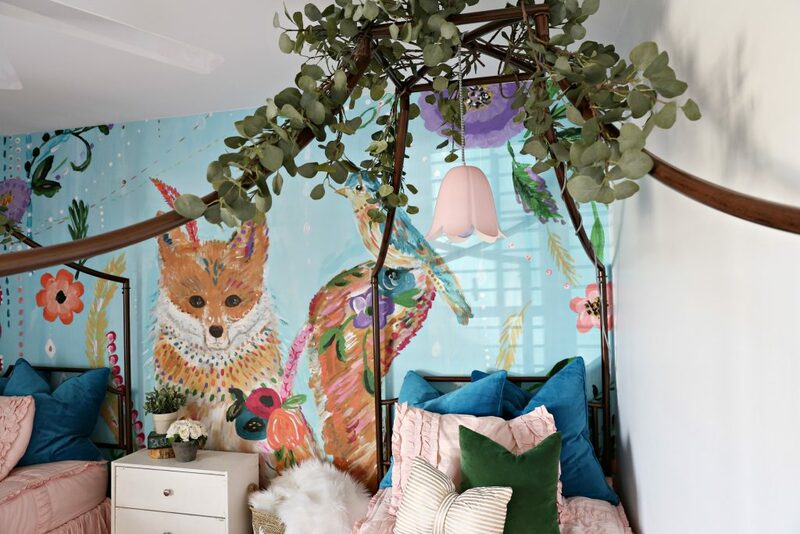 I was not planning on add the greenery but once I wanted to room to feel very whimsical and I think the greenery added such an awesome element to it. The found the greenery at Ikea. 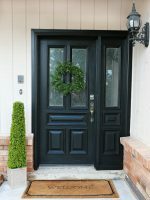 I love this greenery and I have it all over the place at my house. I attached some of it with zip ties then some of it with packing tape. I just layer each piece on top of each other. I got the back blue/tealish pillows from also from Ikea. It’s a 26×26 in pillow case but the pillow form does not fill it out all that great so I would maybe add one more pillow form to it to make it look really full. I got the kelly green pillow at World Market around Christmas time and I love it!! It was only $10. The pillow form was not great inside so I changed it out for a pillow form from Ikea. The cute gold bow pillow is from Target. I also got the cute pink floral pendant light at Ikea. I believe that the shade was like $12 and then I bought the plug in cord for like $10 or so. My girls outlet is turned on and off from the light switch and so the lights are very functional. 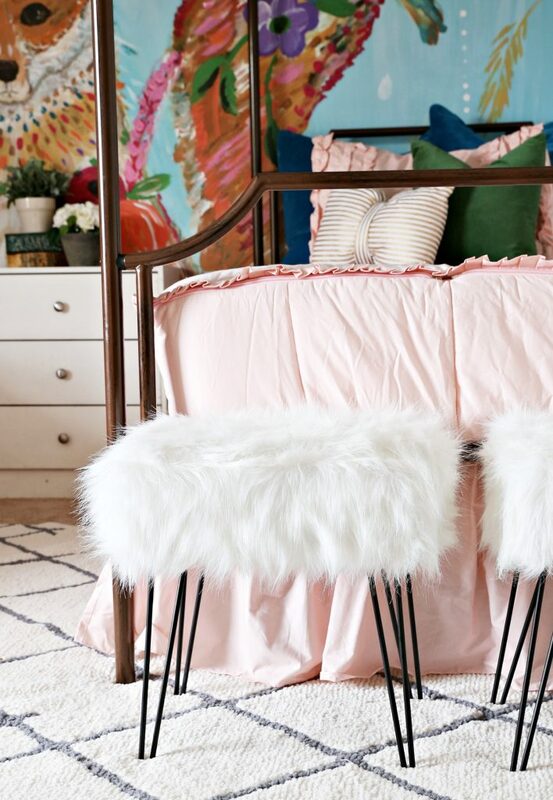 The foot stools at the end of the bed is from American Furniture Warehouse. I don’t think they carry the square fur foot stools anymore but they do have some cute round ones. I had a cute pink rug in here at first but it was not right for the space and I so glad that I went with this rug from Target. My girls totally love their room. They hang out in there all day long. We put up the wall mural and the beds on Christmas Eve and we surprised them on Christmas morning and their reaction was priceless and I am so happy that I recorded the whole thing. I will share that video very soon but until go and find somewhere to in your house to put one of Bari J. murals and if you can’t have a mural somewhere then at least get one of her pieces of art. 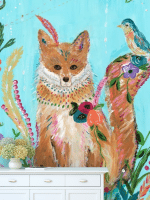 The mural wallpaper is so beautiful, I love that fox too.